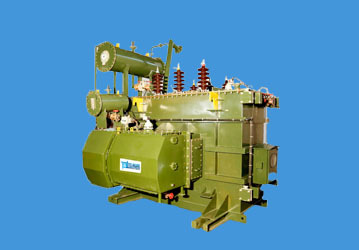 ﻿ Power Transformer | Telawne Power Equipments Pvt. Ltd.
All the transformers of rating above 5MVA and primary voltage class from 11kV to 66kV are conventionally termed as Power Transformers. These transformers are generally used for stepping down voltage in receiving stations in distribution network. Highest dielectric insulation property to withstand lightening impulse. Mechanical design to withstand short circuit forces arising during faults. Optimum oven heating under vacuum as to achieve desired compression height and maximum insulation resistance (IR) to windings. Adequate ducts between layers, coils, discs for maximum oil flow and reduced hot spot temperature. Pre compressed Insulation material for minimal moisture absorption. Permawood rings for uniform clamping. Insulating Fluid PCB FREE Mineral Oil, both inhibited & uninhibited, as per IS/IEC and customer requirement, ASTM D-3487.